Resilient management operates at three levels: individual, team and organisation. At all levels being resilient implies being able to bounce back and thrive in the face of tough challenges. Beyond that, each kind of resilience has very different characteristics and drivers. Personal resilience is an asset that helps us to remain healthy and effective in good times and bad. It is not a fixed set of traits reserved for superheroes – it’s the normal process and outcome of managing life’s challenges. Everyone can improve their ability to manage life in a resilient way, by understanding their own unique starting point and by drawing strength from working through difficult situations. Managers and organisations can support this process, but the main responsibility for developing personal resilience lies with the individual. Doing so has a proven effect on improving confidence, retention and sales success. When teams are well managed, high performance can be sustained over the long term, even in difficult circumstances. Particularly important for building resilience in teams is active management of the main sources of workplace pressure. In any situation some pressures will be positive (e.g. challenging, realistic goals), while others will be negative, (e.g. too much time spent travelling). Resilient team management means assessing the risks, and using positive pressure and support to keep morale and wellbeing high. This in turn improves productivity and other business outcomes. 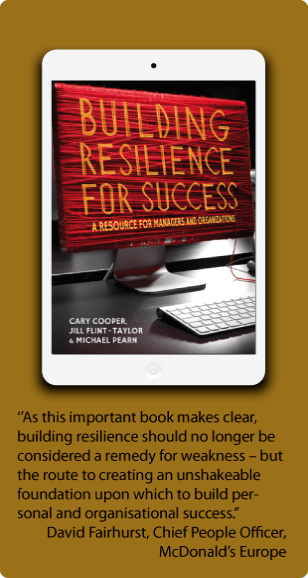 There are two main elements to organisational resilience. The first relates to people, and includes the personal resilience of leaders and the combined resilience of teams. The second relates to the general management of a wide range of risks, and includes planning for natural disasters and threats to IT systems. While our main focus is on the former, balanced leadership is clearly central to both kinds of organisational resilience. Customised resilience modules for induction and development programmes; team resilience risk assessments; resilience coaching for managers and teams; workshops on building resilience and managing conflict; selection and assessment; leadership development.